In Hannah Gadsby’s avant-garde comedy special Nanette, she uses art history as an unexpected rhetorical device illustrating two truths: the legacy of misogyny in popular culture and the incredible ability of abuse victims to “yield and not break.” Without giving away one of my favourite moments of her performance, I can say that, weeks later, I’m still thinking about how she flipped the script on the “tortured artist” stereotype and reframed it as a misconception: artists make art not because they are in pain but because they have enough of a support system to encourage their healing. 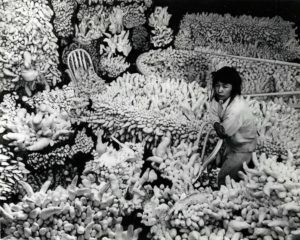 The point is, before Kusama made this art in NYC, she lived in Matsumoto, Japan. One day in a secondhand bookstore, she found a collection of Georgia O’Keeffe paintings and was so excited by her work that she traveled six hours to Tokyo to the American Embassy to seek out O’Keeffe’s address. Miraculously, she found it. She wrote the artist and included several of her own watercolours. When O’Keeffe responded with encouragement, Kusama became determined to move to America. She left Japan in 1957. She was very poor when she arrived in New York City. She lay awake winter nights underneath one blanket, no heat, next to a broken window. She ate discarded fish heads and rotten cabbage soup for dinners. In 1958, with no more money to buy art supplies, she wrote O’Keeffe again and invited her to her studio. Again, O’Keeffe answered and, upon seeing what Kusama was working on, brought her own dealer, Edith Halpert, who purchased one of her pieces. With that money, Kusama bought canvas and paint and created her first Infinity Net, a piece that led to her first solo show Obsessional Monochrome in 1959. The point is, artists make art not because they are in pain but because they have enough of a support system to encourage their healing. Romanticizing the effects of abuse allows us to tolerate abusers, which is probably one of the reasons we do it. It’s much easier to tolerate abuse, to normalize it, to look away, to say “thanks for the art it gave us,” than it is to intervene.